Luxembourg would consider greater transparency of its banking sector to help curb tax evasion, the finance minister has told a German newspaper. In an interview published on Sunday, Luc Frieden said he wanted to "strengthen co-operation with foreign tax authorities". Luxembourg is known for its highly secretive banking sector. Germany is among the countries which say it is being used by foreign customers as a tax haven. Speaking to Germany's Frankfurter Allgemeine Sonntagszeitung newspaper, Mr Frieden acknowledged that other countries were increasingly demanding more information on what their citizens were doing with their money in foreign banks. "The international trend is going toward an automatic exchange of bank deposit information. We no longer strictly oppose that," he said. 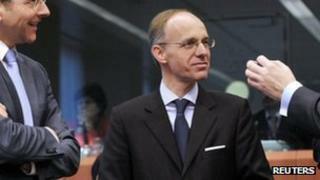 On Friday Germany signed a tax evasion treaty with Switzerland - another European banking centre known for its secrecy. It is designed to allow Germany to claw back taxes from German depositors hiding money in Swiss banks. Luxembourg is a country of only 500,000 people, but its banks and other financial institutions have assets worth more than 20 times the country's economic output. Despite its heavy reliance on financial services, Mr Frieden insisted Luxembourg "does not rely on clients who want to save on their taxes". He has previously said he wants banking customers to be attracted to Luxembourg by the quality of its banking services, rather than its secrecy.